Hot Spots across the U.S.
Congressional Science Fellows spend a year learning how science and policy interact, and a new program helps them to share their knowledge. The longterm nature of the geologic process of shoreline erosion is one reason North Carolina is failing to protect its beaches. 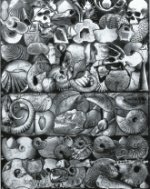 A fossil montage illustrating life's evolution over the last 600 million years. Each horizontal section represents an eon or era from the Proterozoic to the Cenozoic and is sized according to its time interval. Montage by John Pojeta Jr., scientist emeritus at the U.S. Geological Survey and research associate at the Smithsonian Institution National Museum of Natural History. This montage was also printed in the USGS publication Fossils, Rocks and Time.